Background: The aim of this study was radiobiological evaluation of different radiotherapy (RT) techniques, namely, combined photon-electron, two tangential photon beams, and electron therapy which are commonly used for treatment of mastectomy patients. Materials and Methods: The mentioned techniques were planned on the computed tomography (CT) images of a chest phantom, using TiGRT treatment planning system (TPS). The TPS dose calculations were verified using Thermo Luminescence dosimeters (TLD) measurements. 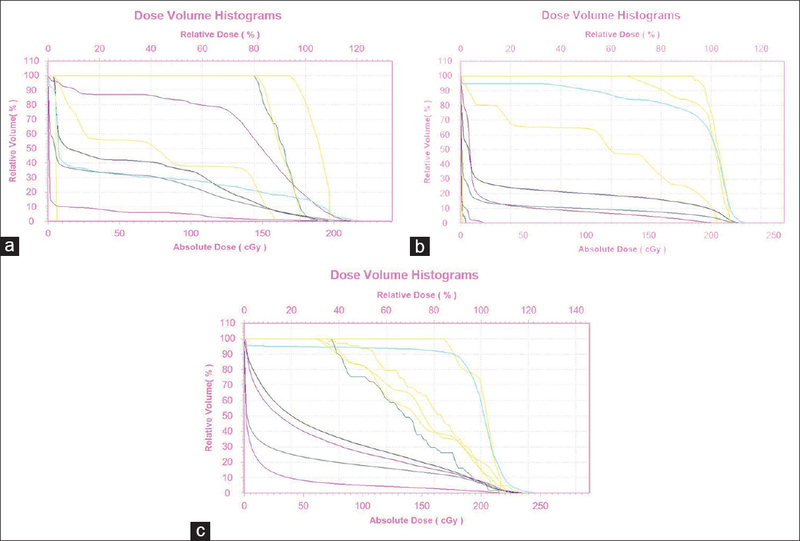 Dose-volume histogram (DVH) of the plans was generated in the TPS, and also tumor control probability (TCP) and normal tissue complication probability (NTCP) values were calculated using DVH data for each technique. For TCP and NTCP modeling, Poisson Linear-Quadatric (PLQ) and Lyman-Kutcher-Burman (LKB) models were used, respectively. Results: The TCPs for the chest wall, internal mammary nodes, supraclavicular nodes, and axilla for the combined photon-electron was 90%, 90%, 90%, and 65%, respectively, which was higher compared to tangential beams (up to 11%, 11%, 5%, and 5%, respectively) and the electron therapy (up to 11%, 11%, 33%, and 23%, respectively) Whereas the NTCPs of the tangential beams for ipsilateral and contralateral lungs, heart, and chest wall–lung interface was 4%, 1%, 3%, and 5.6%, respectively. These NTCP values were considerably lower than electron therapy (up to 42%, 66%, and 40% and 30%, respectively) and combined photon-electron (up to 55%, 75%, 50%, and 20%, respectively) methods. Conclusion: Tangential beam is suggested for treating mastectomy patients, due to sufficient value of TCP, and also lower NTCP compared to the other techniques such as electron therapy and combined photon-electron. There are different RT techniques such as combined photon-electron, two tangential photon beams, and also one direct electron beam which are widely used to treat mastectomy patients. The purpose of all these RT techniques is not only to escalate the maximum possible radiation dose to the tumoral tissues but also to protect the normal tissues from adverse effects of the radiation beams. However, using dose distribution data of different RT plans is not enough to evaluate the efficiency of different RT techniques. This study aimed to evaluate the radiobiological competence of different breast RT techniques including combined photon-electron, two tangential photon beams, and also one direct electron using TCP and NTCP models. A chest wall phantom (designed and produced at Medical Physics Department, School of Medicine, Isfahan University of Medical Sciences, Isfahan, Iran) with 30 transversal slabs was used. The phantom was made of tissue-equivalent Plexiglas and also cork and Teflon which were used instead of lungs and ribs. The chest wall thickness of the phantom was chosen 2 cm. CT simulation images of the used phantom was performed with 1 mm slice spacing. The planning CT images of the phantom were imported to the treatment planning system (TPS) (TiGRT, LinaTech, China). OARs including ipsilateral lung, contralateral lung, and heart were defined and contoured by the stated TPS. The surface of the chest wall, three levels of axilla, supraclavicular, and internal mammary lymph nodes were drawn for the clinical target volume (CTV). The CTV contour was expanded for 1 cm in all direction, as planning target volume (PTV). The Siemens Primus linac measured data were used for commissioning the TPS. In this study, a Siemens Primus linac system with 6 MV photon and 10 MeV electron beams and also 51-pair leaf were used. Treatment planning of the techniques was done according to clinical standards at our department (Seyed Al-Shohada hospital, Isfahan, Iran). The image of the used techniques is illustrated in [Figure 1]. According to [Figure 1]a, in the first method, the whole of the chest wall and also supraclavicular and internal mammary nodes was irradiated by 10 MeV electrons. In the second plan, the chest wall and internal mammary nodes were exposed with tangential beams, and also a single AP photon beam was used to treat supraclavicular nodes [Figure 1]b. A 15° wedge was used for this plan. In the combined photon-electron plan, the supraclavicular and internal mammary nodes were irradiated directionally by 6 MV photon beam, and the chest wall was exposed by 10 MeV electrons [Figure 1]c. The prescribed dose to PTV was 2 Gy per fraction which resulted to a total dose of 50 Gy. Verification of the TPS calculations was also performed using LiF Thermo Luminescence dosimeters, LiF (TLD-100), which were placed inside the phantom. Dose measurements were repeated for 3 independent experiments, and the TLDs were readout with a SOLARO-2A TLD reader (NEC Technology). The dose-volume histograms (DVHs) of the mentioned techniques were generated, and also TCP and NTCP values were calculated using DVH data for each technique. In this study, the Poisson Linear-Quadatric (PLQ) and Lyman-Kutcher-Burman (LKB) models were used for estimating TCP and NTCP, respectively. Where, N is the initial number of tumoral cells, and ps(D) is the cell survival fraction after a dose D.
In this equation, ““m” is the maximum inverse slope of dose-response curve, EUD is the equivalent uniform dose of the organ, and D50 is the total imposed dose to the normal tissues that may lead to force 50% complication to the organ. Comparison of the TPS dose calculations with TLD measurements showed up to 4.9% discrepancy. [Figure 2] illustrates the generated DVHs of the mentioned RT methods. [Figure 3] and [Figure 4] compare the TCPs and NTCPs for target volume and normal tissues, respectively, among the techniques. According to [Figure 3] and [Figure 4], the TCP values for the chest wall, internal mammary nodes, supraclavicular nodes, and axilla of the combined photon-electron was 90%, 90%, 90%, and 65%, respectively. The TCPs for the chest wall, internal mammary nodes, supraclavicular nodes, and axilla of the tangential beams was 80%, 80%, 85%, and 60%, respectively [Figure 3] and [Figure 4]. These Figures also illustrate that the TCP values of the chest wall, internal mammary nodes, supraclavicular nodes, and axilla for the electron therapy was 80%, 80%, 60%, and 50%, respectively. Whereas, for the NTCP, the values of ipsilateral lung, contralateral lung, heart, and chest wall–lung interface for combined photon-electron was 9%, 4%, 6%, and 7%, respectively [Figure 3] and [Figure 4]. According to the Figures, the NTCPs of the tangential method for ipsilateral and contralateral lung, heart, and chest wall–lung interface was 4%, 1%, 3%, and 5.6%, respectively. It was found that the NTCPs of ipsilateral and contralateral lung, heart, and chest wall–lung interface for electron therapy was 7%, 3%, 5%, and 8%, respectively [Figure 3] and [Figure 4]. This study was performed on radiobiological evaluation, including TCP and NTCP, of two different RT techniques such as combined photon-electron, two tangential photon beams, and electron therapy which are widely used for the treatment of mastectomy patients. [Figure 3] and [Figure 4] give the comparison of TCPs and NTCPs between the mentioned techniques. Our data showed that the TCPs and NTCPs were different among the studied methods [Figure 3] and [Figure 4]. According to [Figure 3] and [Figure 4], the TCP values of the chest wall and internal mammary nodes for the tangential photon beams and electron therapy was same while the TCP value for supraclavicular nodes of the tangential beams was different compared to electron therapy (up to 29%). The NTCPs of the OARs for the tangential was different compared to electron therapy [Figure 3] and [Figure 4]. The NTCPs of the ipsilateral and contralateral lung and heart was lower than electron therapy (up to 42%, 66%, and 40%, respectively). This was seen as a result of the high-dose region before sharp dose drop-off of the electron beam beyond the build-up region compared to photon,, and it may impose higher radiobiological effects on chest wall–lung interface. Moreover, it is known that inhomogeneities including lungs and ribs can significantly affect the electron beam.,,, Also, electron beam has x-ray contamination at the end of its path.,,, Another point is the lateral scattering of electrons, which is higher than photons. Therefore, the reasons may lead to increase NTCPs of electron therapy than tangential beams. Similar results have been reported in other studies. Muran et al. have compared the NTCPs for two different tangential methods including conformal tangential and standard tangential irradiation. In the study, the dosimetric data of twenty-six breast cancer patients were extracted from their DVHs, and NTCPs were estimated according to relative seriality model. In their study, they concluded that the conformal tangential method may impose lower complications to normal tissues such as lungs and heart compared to the other studied method. Alizadeh et al. have reported that the NTCP values of heart and lung were smaller in conformal tangential technique compared to conventional tangential one, which is in line with our finding. The results of our study are in an agreement with Hurkmans et al. who stated that using conformal tangential technique may decrease NTCP compared to using rectangular fields. According to results of our study, tangential beams not only may lead to lower NTCPs, but also provide sufficient control over the tumor than other techniques such as combined photon-electron and electron therapy. In this paper, the radiobiological efficiency of different RT techniques including combined photon-electron, two tangential photon beams and electron therapy was evaluated using TCP and NTCP models. Tangential beams could be a good choice to treat mastectomy patients, due to lower NTCPs compared to other techniques such as direct electron and combined direct photon-electron. The authors thank Isfahan University of Medical Sciences for financial support of this article. The authors would also like to thank Mrs. Zeinab Ghasemian for supplying some planning data of the study. Overgaard M, Hansen PS, Overgaard J, Rose C, Andersson M, Bach F, et al. Postoperative radiotherapy in high-risk premenopausal women with breast cancer who receive adjuvant chemotherapy. Danish breast cancer cooperative group 82b trial. N Engl J Med 1997;337:949-55. Whelan TJ, Julian J, Wright J, Jadad AR, Levine ML. Does locoregional radiation therapy improve survival in breast cancer? A meta-analysis. J Clin Oncol 2000;18:1220-9. Smith BD, Haffty BG, Wilson LD, Smith GL, Patel AN, Buchholz TA, et al. The future of radiation oncology in the United States from 2010 to 2020: Will supply keep pace with demand? J Clin Oncol 2010;28:5160-5. Dessena M, Dessi M, Demontis B, Grosso LP, Porru S, Meleddu GF, et al. Exclusive intra-operative radiation therapy (IORT) for early stage breast cancer: Pilot study of feasibility. G Chir 2011;32:104-9. Menard J, Campana F, Kirov KM, Bollet MA, Dendale R, Fournier-Bidoz N, et al. Radiotherapy for breast cancer and pacemaker. Cancer Radiother 2011;15:197-201. Jereczek-Fossa BA, Santoro L, Colangione SP, Morselli L, Fodor C, Vischioni B, et al. Electronic portal imaging registration in breast cancer radiotherapy verification: Analysis of inter-observer agreement among different categories of health practitioners. Neoplasma 2013;60:302-8. Alford SL, Prassas GN, Vogelesang CR, Leggett HJ, Hamilton CS. Adjuvant breast radiotherapy using a simultaneous integrated boost: Clinical and dosimetric perspectives. J Med Imaging Radiat Oncol 2013;57:222-9. Jones JM, Ribeiro GG. Mortality patterns over 34 years of breast cancer patients in a clinical trial of post-operative radiotherapy. Clin Radiol 1989;40:204-8. Khan FM, Gibbons JP. Khan's the Physics of Radiation Therapy. Minnesota, USA: Lippincott Williams & Wilkins; 2014. Zablotska LB, Neugut AI. Lung carcinoma after radiation therapy in women treated with lumpectomy or mastectomy for primary breast carcinoma. Cancer 2003;97:1404-11. Rubino C, de Vathaire F, Shamsaldin A, Labbe M, Lê MG. Radiation dose, chemotherapy, hormonal treatment and risk of second cancer after breast cancer treatment. Br J Cancer 2003;89:840-6. Berrington de Gonzalez A, Curtis RE, Gilbert E, Berg CD, Smith SA, Stovall M, et al. Second solid cancers after radiotherapy for breast cancer in SEER cancer registries. Br J Cancer 2010;102:220-6. Roychoudhuri R, Robinson D, Putcha V, Cuzick J, Darby S, Møller H, et al. Increased cardiovascular mortality more than fifteen years after radiotherapy for breast cancer: A population-based study. BMC Cancer 2007;7:9. Galper S, Gelman R, Recht A, Silver B, Kohli A, Wong JS, et al. Second nonbreast malignancies after conservative surgery and radiation therapy for early-stage breast cancer. Int J Radiat Oncol Biol Phys 2002;52:406-14. Giordano SH, Kuo YF, Freeman JL, Buchholz TA, Hortobagyi GN, Goodwin JS, et al. Risk of cardiac death after adjuvant radiotherapy for breast cancer. J Natl Cancer Inst 2005;97:419-24. Darby S, McGale P, Peto R, Granath F, Hall P, Ekbom A, et al. Mortality from cardiovascular disease more than 10 years after radiotherapy for breast cancer: Nationwide cohort study of 90 000 Swedish women. BMJ 2003;326:256-7. Bouyeh KA, Shokrani P, Amouheidari AR, Roayaei M. Evaluation of different treatment planning of breast cancer patients to estimate complications probability of lung and heart. J Isfahan Med Sch. (In Press). Seppenwoolde Y, Lebesque JV, de Jaeger K, Belderbos JS, Boersma LJ, Schilstra C, et al. Comparing different NTCP models that predict the incidence of radiation pneumonitis. Normal tissue complication probability. Int J Radiat Oncol Biol Phys 2003;55:724-35. Kutcher GJ, Burman C. Calculation of complication probability factors for non-uniform normal tissue irradiation: The effective volume method. Int J Radiat Oncol Biol Phys 1989;16:1623-30. Warkentin B, Stavrev P, Stavreva N, Field C, Fallone BG. A TCP-NTCP estimation module using DVHs and known radiobiological models and parameter sets. J Appl Clin Med Phys 2004;5:50-63. Salem A, Mohamad I, Dayyat A, Kanaa'n H, Sarhan N, Roujob I, et al. Combined photon-electron beams in the treatment of the supraclavicular lymph nodes in breast cancer: A novel technique that achieves adequate coverage while reducing lung dose. Med Dosim 2015;40:210-7. Prasad SC, Bedwinek JM, Gerber RL. Lung dose in electron beam therapy of chest wall. Acta Radiol Oncol 1983;22:91-5. Tavakoli MB, Taheri H, Akhavan A. Evaluation of calculation errors of treatment planning system in dose distribution of electron beams of 3D-CRT inside the lung. J Isfahan Med Sch 2017;35:900-4. Muren LP, Maurstad G, Hafslund R, Anker G, Dahl O. Cardiac and pulmonary doses and complication probabilities in standard and conformal tangential irradiation in conservative management of breast cancer. Radiother Oncol 2002;62:173-83.